Getting other people to do what we want is a useful skill for anyone. Whether you’re seeking a job, negotiating a deal, or angling for that big promotion, you’re engaged in strategic thought and action. In such moments, you imagine what might be going on in another person’s head and how they’ll react to what you do or say. At the same time, you also try to pick the best way to realize your goals, both with and without the other person’s cooperation. Getting Your Way teaches us how to win that game by offering a fuller understanding of how strategy works in the real world. As we all know, rules of strategy are regularly discovered and discussed in popular books for business executives, military leaders, and politicians. Those works with their trendy lists of pithy maxims and highly effective habits can help people avoid mistakes or even think anew about how to tackle their problems. But they are merely suggestive, as each situation we encounter in the real world is always more complex than anticipated, more challenging than we had hoped. James M. Jasper here shows us how to anticipate those problems before they actually occur—by recognizing the dilemmas all strategic players must negotiate, with each option accompanied by a long list of costs and risks. Considering everyday dilemmas in a broad range of familiar settings, from business and politics to love and war, Jasper explains how to envision your goals, how to make the first move, how to deal with threats, and how to employ strategies with greater confidence. Alexander the Great, Genghis Khan, Rosa Parks, Hugo Chávez, and David Koresh all come into play in this smart and engaging book, one that helps us recognize and prepare for the many dilemmas inherent in any strategic action. 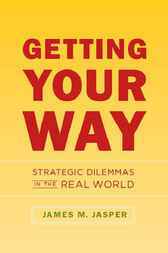 "Getting Your Way gives us a fresh, powerful perspective on strategic action in social and economic life. It brings a robust theory of action and choice to sociology and political science as it breathes life into the sterile world of game theory and economics. Written with precision and flair, it is a must-read for anyone­—academics or practitioners­—interested in understanding and thriving in business, politics, organizations, and markets." "[An] original and distinctive take on the question of strategy. . . . A refreshingly alternative look at the human dilemmas at the heart of strategic decision-making." James M. Jasper teaches at the Graduate Center of the City University of New York. His previous books include The Art of Moral Protest and Restless Nation: Starting Over in America, both of which are published by the University of Chicago Press.